Iam in strange situation whether to shout at Govt for petrol price hike or keep mum looking at surging International Oil prices. 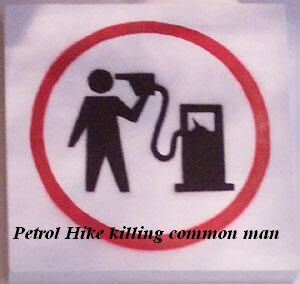 At my heart i feel Petrol price hike is inevitable, though it hurts my pocket very badly. I would definetly appreciate if govt finds some solutions to checkmate the ever surging prices. Any alternatives like mixing ethonol or cutting some taxes over fuel etc.. May be time had come where we have to adjust our living standards in terms to ever rising Fuel prices. Iam more astonished to see Communists protesting in streets over Petrol price rise. In first place they support the UPA govt policies at Delhi and they are the in front to fight the same Govt policies in streets . If they are really against price rise , why dont they withdraw the support ?? Why these Double standards? I feel its high time people defeat and discard these Leftists.